What is TMJ Disorder and Why Should it be Treated? Do you suffer from frequent headaches, especially in the morning? Do you ever experience pain or tenderness in your jaw when you bite or chew? Do you ever hear your jaw pop or click when you open or close your mouth? Did you know you might be suffering from TMJ? What is TMJ disorder and why should it be treated? Cosmetic & Family Dentistry has some answers for you. The temporomandibular joint, or TMJ, is the joint that connects your jaw to your skull. 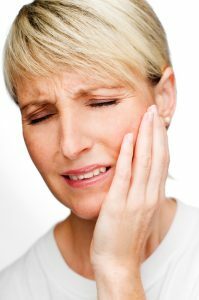 When the hinge connecting your upper and lower jaw isn’t working correctly, it can lead to a host of symptoms that we discussed earlier, and this jaw joint disorder is known as TMJ. If left untreated, severe cases of TMJ can become quite painful and debilitating, and could even lead to damage to your teeth. At Cosmetic & Family Dentistry, Dr. Deborah Romack and Dr. Garrett Mulkey have advanced training in helping patients successfully manage their TMJ. There are a number of factors that can cause TMJ, and we utilize computerized jaw joint analysis technology, or JVA to help us measure temporomandibular joint function. JVA uses wave signatures that are recorded on a computer to help diagnose what is causing your TMJ, so we can plan the most effective treatment for your needs. Clenching and grinding your teeth at night may cause TMJ issues, and our doctors can create an oral appliance to eliminate the pressure from grinding and clenching that can cause damage to your teeth or jaw joint. Misalignment of the joint could also be causing issues, and Dr. Womack or Dr. Mulkey can create an oral appliance that repositions the jaw to reduce the strain from misalignment, and encourage proper positioning for improved function. If you or a loved one experiences jaw pain or frequent headaches, we encourage you to contact Cosmetic & Family Dentistry. TMJ can be difficult to recognize and diagnose, which can sometimes make your pain and your situation feel hopeless. Dr. Womack and Dr. Mulkey understand that each patient is unique, and our TMJ therapy is custom designed based on the patients’ individual needs. Give our office a call today to learn more about how we can get you back on the path to wellness again. by: tntadmin at December 1, 2016 . Comments Off on What is TMJ Disorder and Why Should it be Treated?